One of the very first things music therapy students learn when preparing for practicum experiences and internships is a greeting song and a goodbye song. Learning those staple songs seems like an easy task, but it’s much more complex than it sounds. These two vital songs help clients transition in and out of music therapy, while also setting the tone for the coming activities — from beginning a music class or therapy session, to afterwards moving on to another (usually, not as fun) activity such as focusing on schoolwork or going home. Hello and goodbye songs are essential, and lucky for us, there are many goals we can target besides greeting peers and transitioning during those songs. This week, I’ll be sharing a few songs that accomplish just that! “H-E-L-L-O” and “Good B-Y-E” are catchy and upbeat songs that can be used as bookends to sessions, groups and classes. Both songs launch right into an attainable and age-appropriate goal for young children: improving pre-reading skills! The choruses provide at least 3, count ‘em 3(!! ), opportunities to practice spelling hello or bye. Additionally, each song also holds space for all participants in a group setting to say hello or goodbye. These two songs are ideal for children who are beginning to spell or learning to read, and have made appearances in my own kindergarten and early elementary special needs music therapy sessions. “H-E-L-L-O” and “Good B-Y-E” can be used to address nonverbal language and communication skills, as well. I’ve seen my clients type “hello” out on their communication devices or use sign language to spell “bye”. In those instances, I’ll slow down when it comes time to spell so that my clients have appropriate processing time as well as time to complete the physical task at hand. It’s impossible not to have a “Good Time” when you start a music group with this song (cheesy, but true!). The melody and lyrics reinforce that it’s time to move and groove, plus the second verse allows for the teacher or therapist to detail the schedule for the music class or therapy session. “Good Time” has many opportunities (about 10) to improve articulation of that G sound and to also vocalize “good time” along with the song or in a call-and-response manner. 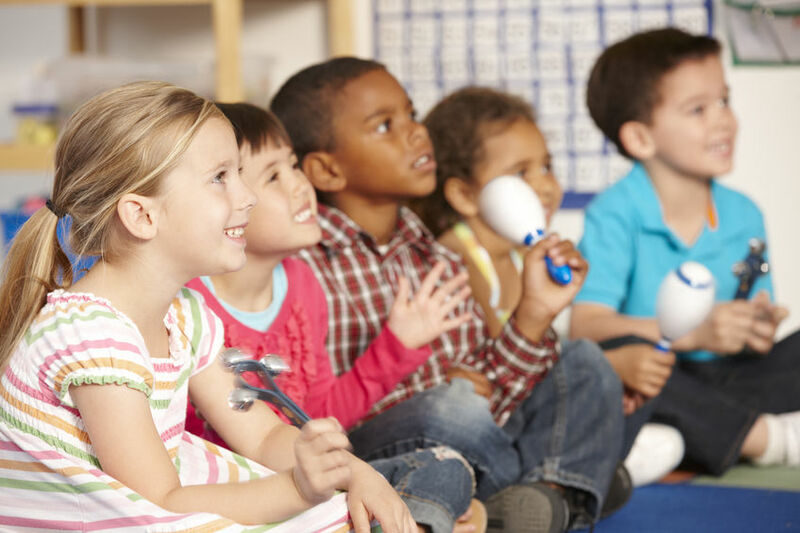 Additionally, “Good Time” provides a turn for participants to identify specific activities if visual schedules are being used, or to use working memory to properly sequence activities that were seen on a schedule board or sung to them in the lyrics. Talk about working on some super important executive function skills! “How Do You Say Goodbye” is a sweet goodbye song that encourages participants to be creative and think of different ways to say goodbye, whether by being silly, giving a high five, or even using a different language. This song also has a fun verse that participants can sing along with, and in turn, increase verbalization. Although thinking of different ways to say goodbye might be easy and fun for some, it may also be very difficult for others. Many of my students and clients fall into this latter category; being creative is often a challenge for them. When utilizing this song, I can demonstrate different kinds of goodbyes or present picture cards so that each child has the opportunity to make a choice. These hello and goodbye songs will elevate your practice by allowing you to target even more goals during your sessions or classes. Hello and goodbye songs can be more than transition songs, and these four are great examples of what we can do when we think out of the box! Tell me in the comments: what other goals do you target during greeting songs? You can listen to all of these songs in their entirety here and here. Lyrics, chords, mp3, and instrumental track for these original songs are available for download. As is the case for all Listen & Learn Music creations, we invite you to adapt this song as needed to best serve your students and/or clients.